Introduction and interview by Niram Ferretti. The Italian version is at "Daniel Pipes: 'I palestinesi hanno perso ma vogliono ancora rimpiazzare Israele'." Daniel Pipes recently visited Israel to introduce the Knesset Israel Victory Caucus, which now joins a Congressional Israel Victory Caucus inaugurated in Washington. Both groups are based on a concept explained in a seminal article Pipes wrote in January 2017 published by Commentary as "A New Strategy for Israeli Victory." After a successful presentation event at the Begin Center in Jerusalem, organized by the Middle East Forum, during which Martin Sherman, Melanie Philips, Richard Kemp, Einat Wilf, among others, all gave insightful speeches about the Arab-Israeli conflict, l'Informale met up with Professor Pipes in Tel Aviv. 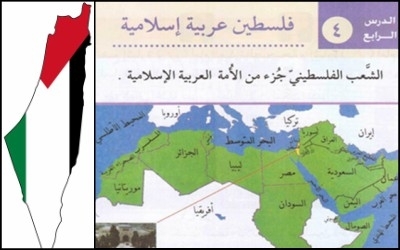 A fantasy map of Palestine, with the PLO flag's colors, and a second-grade Palestinian Authority textbook geography lesson that leaves out Israel. Please explain the Knesset Israel Victory Caucus and its main aims? Its main goal is to convince the Palestinians that the war they have waged against Zionism, the Yishuv, Israel, and Jews is over – and that they lost. It is time to see that this conflict has reached its end and to close it down. As an American, I hope that the present or a future American president will tell the Israelis, "Do what you need to do within political, moral, legal boundaries to convince the Palestinians that they have lost." I hope the Israelis will then do exactly that. Then we can focus on the Middle East's real problems, such as the Syrian civil wars. Have the Palestinians indeed lost? Yes, they have lost. They live in a fantasy world. They promote the map of British Mandatory Palestine that disappeared 69 years ago; they believe UNESCO'S verdict that the Tomb of the Patriarchs in Hebron is a Palestinian historic site; they depend on foreign assistance to fund their economy; they celebrate suicide bombers as heroes. They inhabit a crazy world that has continued too long, doing damage to Israelis and Palestinians alike, killing the former and distorting the latter. Once they acknowledge defeat, they can move on and construct their polity, economy, society, and culture. In the fifty years since the Six Day War, the Arabs (with invaluable assistance from the Russians) built a persuasive narrative depicting Palestinians as victims and Israelis as oppressors. Has Israel been deficient in combating this propaganda? 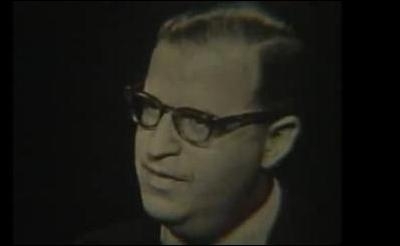 Abba Eban in 1958, when he spoke on American television the words quoted here. Yes, quite so. Who a hundred years ago could have predicted that Jews would be the great warriors and Arabs the great publicists? The Palestinian narrative of victimhood and misery has generally overwhelmed the Israeli one of, to quote Abba Eban, "joyous creation, of sovereignty restored, of the people gathered in, of a land revived, of democracy established." The election of Donald Trump created an expectation in Israel of major changes. Other than a friendlier attitude, this administration seems to be pursuing the old policies, especially pressuring Israel to negotiate as equals with the Palestinians. Do you agree? Major changes have taken place at the United Nations where Nikki Halley has rapidly become an extraordinary spokeswoman for changing America's UN policy concerning Israel. In terms of Palestinian-Israeli negotiations, yes, there has been a return to the usual "peace process," but its substance is unclear. It differs from Obama's, but does it also differ from George W. Bush's and Bill Clinton's? We don't know, for the administration is still formulating its policies. As we speak, Jason Greenblatt is spending three days in Israel in consultation with the America ambassador, the Palestinian Authority, and Government of Israel, working on policy. I expect the new policy is quite different from the prior ones. Yasir Arafat interpreted the Oslo Accord as a sign of Israeli vulnerability, so he incited violence against it, culminating in the Second Intifada. Isn't it clear by now that the Palestinians see negotiations as another way to fight Israel? Yes, and this is by now clear to a significant majority of Israelis. It is not clear, however, to much of the outside world. Many observers think that on September 13, 1993 Arafat and the Palestinians accepted Israel, therefore the outstanding problems concern details; if diplomats would just work harder, those will be resolved. But that's wrong: What Arafat did at Oslo was a pretense. The great majority of Palestinians, about 80% of them, still do not accept Israel. The Palestinian leadership, both in Ramallah and Gaza, does not try to reduce that number. To the contrary, it wants to increase rejection of Israel to 100%. It has not fulfilled its part of the Oslo bargain but continues the hapless fight for "revolution until victory." Its maps in Arabic almost always never show the West Bank next to Israel but rather a British Mandatory Palestine instead of Israel. In short, it wants to pretend Israel does not even exist. Is the Arab-Israeli conflict part of a wider clash between Islamism and the Western way of life? Four distinct movements have inspired the Arabs against Zionism: in chronological order, they are pan-Syrianism, pan-Arabism, Palestinianism, and Islamism. So, only part of the Arab-Israeli conflict is connected to Islamism. The Islamist movement began in Egypt, Iran, and India in the 1920s; you won't be happy to hear this, but Mussolini was an important inspiration, especially in Egypt. The dream of reviving ancient splendor through state power and militarism inspired many Muslims. This project has steadily been gaining strength during the past century. It is an "ism" in the same way as socialism, fascism, and liberalism. It is a modern form of Islam; it has antecedents but it is modern. In economics, for example, traditional Islam has only rudimentary notions, for medieval Muslims did not dwell on this topic. Islamists turned simple regulations into elaborate treatises. Islamic economics is a innovative aspect of Islam. Mordechai Kedar of Bar-Ilan University. 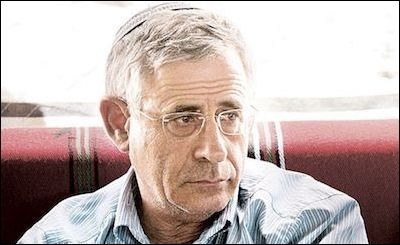 In an interview, Mordechai Kedar rejected the distinction between Islam and Islamism as artificial. "Muslims" he said, "are divided into two kinds: those who believe in Islam for Muslims only and those who try to impose it on others." Do you agree? It's a novel and useful division, but it doesn't replace the crucial distinction between Islam and Islamism. Islamists wish to go back to the glory days of one thousand years ago when Cairo, Baghdad and Damascus were leading cities and when Muslims were the richest and most powerful people. For Islamists, applying Islamic law is the way to get there. ISIS is the ultimate example of this phenomenon. Other Islamists pursue the same path in less extreme ways but with the same goal. Erdoğan in Turkey follows the ISIS path more cautiously and slowly but even he threatens beheadings. Of course, not all Muslims are Islamists, meaning they do not see the application of Sharia as the way to become rich and strong. Anti-Islamist Muslims are the hope for the future. Islam divides the world in two opposite and conflicting spheres, Dār al-Islām and Dār al-Ḥarb, the House of Islam and of War. Given this premise how can Muslims coexist with the West? From a modern point of view, Islam has many problematic aspects. Two of the greatest are Muslim relations with non-Muslim and male relations with females. In both cases, from today's vantage point, Islamic ways are intensely backward. "Religions, being human constructs, change over time. Islam is what Muslims make of it." The good news is that all religions, being human constructs, change over time. Islam is what Muslims make of it. In the words of an Egyptian philosopher, "Islam is like a supermarket, you can take from it what you will." Islam changes all the time. In my career, I have seen Islam going from more moderate to more extreme; that implies that it can also become more moderate. We non-Muslims need to work against Islamists and help anti-Islamists. That takes up much of my work. As my slogan goes, "Radical Islam is the problem, moderate Islam is the solution." I see the Islamist movement peaking in 2012 and facing deep problems. Yes, it still has plenty of successes, particularly in Turkey, but it is unpopular with the people who live under the system, plus Islamists are fighting each other. These trends are best shown in Egypt, with the revolt four years ago, and Syria, with Sunni and Shia fighting each other. Like the other modern totalitarian movements, I expect Islamism will fail.